⊕ The prerequisite for this seminar is PHI 328 (History of Ancient Philosophy) or the equivalent. "So here [in Epictetus in late Stoicism] we have our first actual notion of a free will. It is a notion of a will such that there is no power or force in the world which could prevent it from making the choices one needs to make to live a good life or force it to make choices which would prevent us from living a good life" (A Free Will, 77). "God must set things up in such a way that neither human nature nor our individual nature nor the circumstances into which we are born, either separately or jointly, prevent us from become wise and free. Indeed, the Stoics not only assume this, they also assume that God sets things up in such a way that we all, in the course of our natural development, could acquire the understanding and the insight to make the right choices. God constructs human beings in such a way that they could naturally acquire true beliefs. ... Hence our having the true beliefs we have does not require an explanation.... What does require explanation is our having false beliefs. They must be due to the fact that something went wrong, interfering with the natural process which would have led to our having just true beliefs. And the Stoics identify what wrong with out giving assent to a false impression, when we should give assent only to those true impressions which are recognizably true. ... What needs an explanation is why we do not get there, because something went wrong. And the answer again is that we ourselves abort this natural development by being rash, careless, or impatient in the way we give assent. Here, then, we have, for the first time in history, a notion of free will, a will which is not forced in its choices and decision and hence is free to make the right choices" (A Free Will, 84-85). "Now, though I do not presuppose a specific notion of a free will, let alone want to endorse or advocate some specific notion of it, I do rely on something like a general idea of a free will,something like a schema which any specific notion of a free will or any particular version of the notion of a free will, at least in antiquity, will fit into. I do not arrive at this general idea or schema on the basis of some philosophical view as to what any notion of a free will has to look like but rather with the benefit of historical hindsight. That is to say, I have looked at the relevant ancient texts and have abstracted this schema from those texts which explicitly talk of a will, the freedom of the will, or a free will. In having such a schema, we shall at least have a general idea of what we are looking for when we investigate the origins of the notion of a freewill but without having to commit ourselves to any particular view, ancient or modern, as to what a free will really is" (A Free Will, 6-7). In 1997-98, Michael Frede was the Sather Professor of Philosophy of Classical Literature at the University of California, Berkeley. It is a requirement of the professorship that its holder give lectures later to be published by the University of California Press. Frede's death in 2007 prevented him from putting the lectures in their final form, but they now have been edited and published as A Free Will. Origins of the Notion in Ancient Thought. "Let us assume that it is a fact that, at least sometimes when we do something, we are responsible for what we are doing, as nothing or nobody forces us to act in this way; rather, we ourselves desire or even choice or decide to act in this way. Let us also assume, as is reasonable enough, that this is what the Greeks believed all along. ... The notion of a free will was originally introduced within the context of a particular theory, namely, a late Stoic theory, in a way specific to this theory, to account for this presumed fact" (Frede, A Free Will, 3). In this course, we will try to understand and evaluate Frede's claim about free will. The letter grade for the course for is a function of the point grades on five writing assignments and five discussion posts. The writing assignments and discussion posts are worth 10 points each. The assignments (50 points), discussions (50 points) total to 100 points. There is no extra credit, and late work is not accepted without good reason. The point total determines the letter grade for the course: A+ (100-97), A (96-94), A- (93-90), B+ (89-87), B (86-84), B- (83-80), C+ (79-77), C (76-70), D (69-60), E (59-0). Incompletes are given only to accommodate serious illnesses and family emergencies, which must be adequately documented. Frede makes "choice" a necessary condition for the will. Further, he seems to think that if an ancient theory of mind that does not include "choice" this absence is evidence that the author of the theory did not recognize the existence of the will. This provides the basis for an argument that the origin of the notion of a will in ancient philosophy is subsequent to Socrates. "In order to get any notion of a will at all, one must assume the following. Unless one is forced or made to do something in such a manner that what one is doing is in no way one's own action (as when one is pushing something over because one is pushed oneself), one does what one does because something happens in one's mind which makes one do what one does. Moreover, one has to assume that what happens in one's mind which makes one do what one does is that one chooses or decides to act in this way. Or at least one has to assume that there is something going on in the mind which can be construed as a choice or decision" (Frede, A Free Will, 7). The Greek noun ψυχή is traditionally translated as "soul" in the ancient philosophers, but this can be misleading given the contemporary meaning of the English word. ⊕ Although ψυχή translates as "soul," it transliterates as psyche and is the etymological root of the word psychology. The ancient Greeks thought that a living human being has a ψυχή and that this ψυχή leaves the body when the person dies, but there was less agreement on the role the ψυχή plays in a living human being. It was clear to the ancient Greeks that human beings can think about things and form beliefs and that human beings can form desires and that desires motivate human beings to act in various ways, but they did not initially conceive of beliefs and desires as part of the ψυχή or "soul." Socrates seems to have taken the seminal step in thinking about human beings in this way. He seems to have thought that human beings are "psychological" beings. That is to say, he seems to have thought that what human beings do (as opposed to what they are made to do) is explainable in terms of their ψυχή or "soul" and that beliefs and desires are integral parts of the soul. "Socratic intellectualism" is the name historians use to designate this understanding of the soul. According to Socrates, at least as Plato seems to portrays him in the Protagoras, all desires either are or stem from beliefs about what is good and what is bad. ⊕ Socratic intellectualism runs contrary to common belief. It is ordinarily thought that a human being might believe that something is good or bad but nevertheless find himself overpowered by a desire to act contrary to this belief. A smoker, for example, to use a modern example, might firmly believe that not smoking is good but nevertheless find himself overpowered by a desire to smoke. Further, it is not necessary to appeal to cases of compulsion. It is ordinarily thought that one might be hungry and desire to eat but not have the belief that eating is good. A desire for something is or stems from the belief that the thing in question is good. Socrates, in this way, thought that the human psychology is "intellectualist." He thought that a human being controls his desires and thereby controls his actions (and thus the direction his life takes) by controlling his beliefs. This a standard interpretation of Socrates, but there is the question of how well the dialogues support it. It seems to be a plausible interpretation of the Protagoras, but it is less clear that it is a plausible interpretation of the discussions of desire in the Gorgias and the Meno. You are free to discuss the assignments and to post questions about them. has the ability to give rise to a desire. The desire in reason is a function of beliefs about what is good and what is bad, but the desires in the appetite and spirit are not. The desire in the appetite arises in response to events in the body. It is a little less clear how desire arises in the spirit, but the idea seems to be that human beings are social animals and have desires to go along with group behavior. The idea is not that they form a belief that it would be good to conform and then form a desire to conform on the basis of the belief. Rather, the desires arise automatically in response to the observed behavior of the group. Aristotle is Plato's first great critic, but he is also the first great Platonist. ⊕ Aristotle rejects the Platonic ontology of the soul and its relation to the body. Aristotle does not think that the soul exists separately from the body. Nor does he think that reason is inborn. Aristotle thinks that reason develops over time in human beings. This is his theory of induction. Although Aristotle denies that reason is inborn, he is in agreement with Plato that some knowledge is intrinsic to reason. Reason is not just a matter of making inferences. Aristotle follows Plato against the intellectual conception of desire that Socrates seems to have held. Aristotle thinks that not all desires are or stem from beliefs about what is good or bad. "Wish" (βούλησις) is the form of desire that belongs to reason. "Appetite" and "spirit" belong to the nonrational part of the soul (= the part of the soul without reason). As part of his inquiry into "virtue" (ἀρετή), Aristotle discusses τὸ ἑκούσιον and τὸ ἀκούσιον. His distinction between the ἑκούσιον and the ἀκούσιον is a distinction between what one does of his "own accord" and what he does "not his own accord." According to Aristotle, "choice" (προαίρεσις) is something that one does of his own accord because choice is a form of "wish." Aristotle, however, does not think that everything a human being does of his own accord is motivated by a "wish." He thinks that a human being can, of his own accord, do something because he is motivated by the nonrational desires "appetite" and "spirit." Frede says that a "wish" is a "willing," but he stresses that it is misleading to represent Aristotle’s distinction between what human beings do ἑκόντες and ἄκοντες as a distinction between "willing" and "unwilling" action. When a human being acts on a non-rational desire, he acts on his own accord and hence ἑκόντες. His desire, however, is not a βούλησις. As Frede explains, "there is no notion of willing in Aristotle such that somebody could be said to act voluntarily or willingly whether he acts on a rational or a non-rational desire" (A Free Will, 26). ⊕ Frede does not say so explicitly, but it is clear that he takes this point about desire and action to be true of Plato too. This understanding of "willing" alone does not justify the conclusion that Aristotle did not talk about the "will" in his explanation of action in human beings. It is necessary to know what the "will" is, and Frede seems to rely on the assumptions that ⊕ "[T]he notion of the will, at least in antiquity, involves a notion of the mind such that the mere fact that one feels hungry will not yet explain why one is having something to eat. This is supposed to be so, because, even if one does feel hungry or does feel like having something to eat, one might choose or decide not to have anything to eat because one thinks that it would not be a good thing to have something to eat now. One might also decide to have something to eat,though one does not feel hungry at all, because one thinks that it would be a good thing to have something to eat. But, in any case, for there to be an action that is one's own action, there is supposed to be an event in one's mind, a mental act, a choice or decision which brings about the action. The notion of a will, then, is the notion of our ability to make such choices or decisions which make us act in the way we do" (A Free Will, 8). for a disposition of reason to be the "will," it must cause every action. Frede says that a condition necessary to have "any notion of a will at all" is that everything one does of his own accord is the product of "something going on in the mind which can be construed as a choice or decision" (A Free Will, 7). 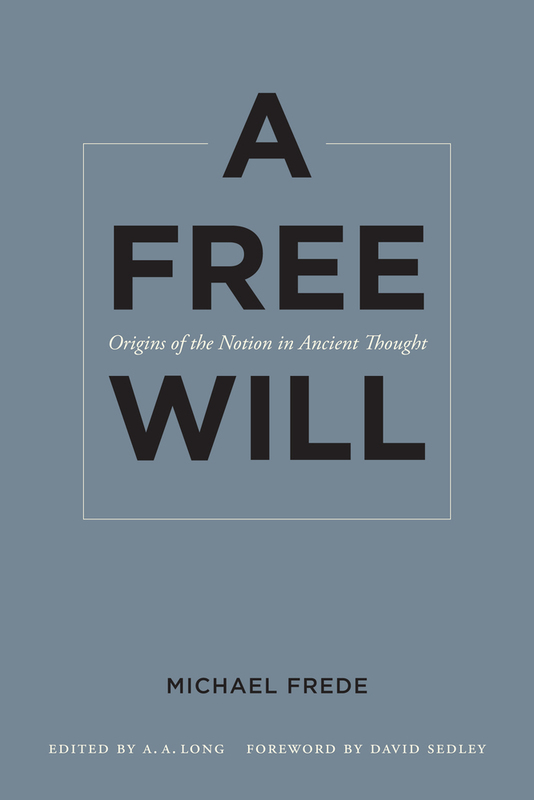 Hence from the fact that for Aristotle not everything a human being does of his own accord is the product of a "choice," Frede concludes that "Aristotle does not have a notion of a will" (A Free Will, 31). "The ΕΦ' ΗΜΙΝ in Ancient Philosophy," Michael Frede. ΦΙΛΟΣΟΦΙΑ, 2007. The Stoics, like the Hellenistic philosophers generally, tried to correct what they saw as mistakes in the prior classical tradition of Plato and Aristotle. Plato and Aristotle thought that the soul has both a rational and a non-rational part and that Socrates had wrongly overlooked the non-rational part. The Stoics thought that Socrates was right. They thought that although a human being begins life with a non-rational soul, this soul ceases to exist when a human being acquires reason (by age fourteen) and becomes rational. Thus, according to the Stoics, Plato and Aristotle failed to realize that the non-rational soul is transformed and replaced by a rational soul. In adult human beings, the Stoics thought that all motivation is completely a matter of reason. The Stoics developed their theory of "impressions" (φαντασίαι) as a clarification and development of the Socratic idea that motivation has its basis in reason. They thought that all motivation in human beings occurs in terms of "impulsive impressions" (φαντασίαι ὁρμητικαί). Further, they thought it is necessary to distinguish the conditions under which impulsive impressions generate purposeful behavior in children and animals, on the one hand, and in adult human beings, on the other. When a child becomes an adult, although motivation still occurs in terms of impulsive impressions, now "assent" (συγκατάθεσις) is necessary for impulsive impressions to generate behavior. Assent is a function of reason. Because the souls of animals and children lack reason, they cannot assent. The presence of an impulsive impression in them automatically generates behavior, but adults act in terms of reason. ⊕ It is possible get some idea of how impulsive impressions generate purposeful behavior in animals and children by considering a cognitive model that uses maintenance and achievement goals to explain behavior. A maintenance goal encodes a relationship with the world that an agent is designed or has evolved to maintain through its behavior. If the relationship the fails, the maintenance goal issues in an achievement goal. 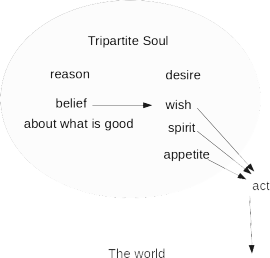 The achievement goal motivates behavior to reinstate the relationship with the world. Consider hunger, for example. When animals are hungry, they move to find food and eat it. In terms of the model, the conditional "if I am hungry, I find food and eat it" is instantiated in the animal so that it functions as a maintenance goal. When the animal registers the truth of the antecedent, the content of the consequent is activated as an achievement goal. This achievement goal moves the animal to find food and eat it. This cognitive model provides a way to identify what the impulsive impression is and what gives this impression its impulsive character. The impulsive impression is what triggers the maintenance goal. The maintenance goal is what gives the impulsive impression its impulsive character, or what Frede what calls its “coloring” (Frede 2011: 36). In the context of Stoic psychology, the maintenance goal supervenes on the way nature designs animals and children. The Stoics thought that nature in its providence constructs animals and children so that when they have certain impressions they naturally engage in forms of behavior that are conducive to survival. The impressions impel animals and children to behave in these ways. Unlike animals and children, adults act for reasons. In them, the impulsiveness of an impression consists in judgments of reason about what is good and what is bad. Only against the background of these judgments about what is good and what is bad does assent to an impulsive impression constitutes an "impulse" (ὀργή). In this way, the Stoics follow in the tradition of Socratic intellectualism about motivation. The sage is not confused about what is good and about what is bad. He does not think that good applies to the world in so far as he is healthy, eats when he is hungry, and generally has the things that people ordinarily think are good. He does not have false beliefs about what is good and what is bad. According to the Stoics, the sage understands that the good applies to the world because it is ordered perfectly rationally. He understands that human beings have a part to play in sustaining this order and that human beings play this part by acting rationally. The sage is not omniscient. He does not know what will happen in any given situation, but he knows that the natural order is in general one in which human beings eat things they like, maintain their health, and do the other things that ordinary people typically regard as good. His attitude toward eating when hungry, regaining his health if he has fallen ill, and so on, is not that doing so is good. Instead, he tries to do these things because his understanding of the natural order has the consequence that doing these things is "preferred" (προηγμένα). In general, they are the right things to do. Is there a notion of "will" in this theory of assent in early Stoicism? "[A]ny desire of a grown-up human being is a willing, a boulesis. Here, therefore, we do have a notion of a willing which was lacking in Plato and Aristotle, a notion which allows us to say that, when a person does not act by being forced or out of ignorance, the person acts voluntarily or willingly. ... So now we have the notion of assent, and hence the appropriate notion of a willing, but we do not yet have a the notion of a choice, let alone of a will" (A Free Will 42-43). "The Stoic Conception of Reason," Michael Frede. Frede says that explicit discussion of "a notion of a will" first appears in the late Stoics in the work of Epictetus. He says that Epictetus thought that the "will" (προαίρεσις) consists in the "use of impressions" (χρῆσις τῶν φαντασιῶν). This "use" is something in the mind that can be construed a decision or choice that explains everything a human does. Epictetus, according to Frede, thought that assenting is just one of the many things human beings can do with their impressions. ⊕ "[Epictetus] prefers to talk more generally of our "use of impressions" (χρῆσις τῶν φαντασιῶν) or of the way we deal with our impressions. Assenting to them is just one thing we can do with them, though the most important one. So now it becomes clear, and Epictetus makes this explicit, that what is up to us, what is a matter of our choice, is how we deal with our impressions. We can scrutinize them, reflect on them, try to deflate and dissolve them, dwell on them, and, of course, give assent to them. ... And our προαίρεσις ... [is] a disposition to choose to deal with our impressions in a certain way, most crucially to choose how to assent to impulsive impressions. This assent, which you choose to give, will consistute a willing, and this willing is the impulse which makes you act in a certain way. So this ability and disposition, insofar as it accounts for your willing whatever it is that you will do, can be called 'the will.' But the will is called προαίρεσις, rather than βούλησις, to mark that it is an ability to make choices, of which which willings are just products. This indeed is the first time that we have any notion of a will" (A Free Will, 46). Epictetus thought, to use Frede’s words, that human beings "can scrutinize them, reflect on them, try to deflate and dissolve them, dwell on them, and, of course, give assent to them," and hence that the "will" is a "disposition [of reason] to deal with impressions in a certain way, most crucially to choose how to assent to impulsive impressions" (A Free Will, 46).